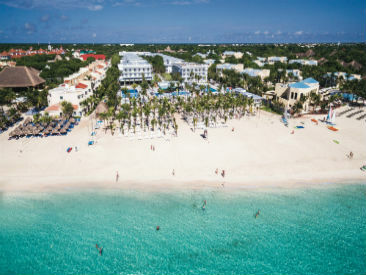 Riu Playacar is a modern, sleek and all-inclusive, Caribbean style resort, located on the gorgeous, white-sand beaches of Playa del Carmen. Filled with lush, tropical gardens and boasting deluxe, four-star accommodations, Riu Playacar is the perfect vacation spot for those seeking a fun and chic tropical experience. 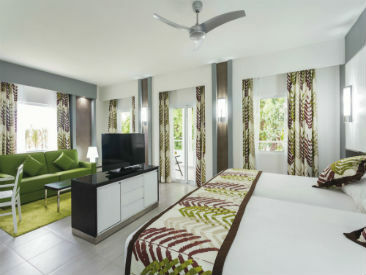 Featuring a full range of amenities, including a mini-bar, RIU’s signature in-room liquor dispenser, a variety of dining venues, sports and entertainment options, as well as privileges at sister hotels within the expansive RIU Resort complex, this resort is sure to surpass even the most selective guests expectations. 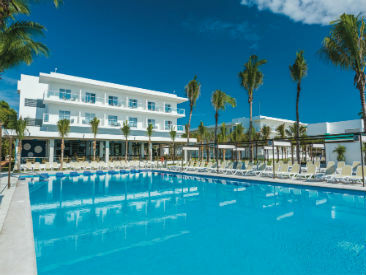 The new Riu Playacar has been entirely re-designed with new restaurants, pools, guest rooms, lobby, wellness center, kids club and free Wi-Fi in public areas. As a guest of the Riu Playacar, you may take advantage of RIU's generous exchange privileges and enjoy the facilities, restaurants, bars, shows and entertainment at the Riu Tequila, Riu Lupita and Riu Yucatan properties adjacent to the resort. Within walking distance or a 5 minute cab ride you will find the charming and eclectic town of Playa del Carmen. Explore the shops on the famous Fifth Avenue, experience the nightlife, or catch a ferry for a day trip to Cozumel from this lively town that is the true hub of the Mayan corridor. With RiuLand, kids ages 4-7 and 8-12 enjoy age-specific entertainment daily, promoting fun learning through outdoor physical activities including group games and sports, cultural games and swimming pool recreation. Riu Playacar provides preferential conditions and additional value to their guests when contacting, booking and paying directly at Hard Rock Golf Club Riviera Maya.